Oculus has unveiled a brand new virtual reality headset designed to replace its flagship product, the Oculus Rift. Unveiled during this year's Game Developers Conference in San Francisco, the Oculus Rift S is the next iteration of the firm's PC-powered virtual reality headset and draws on breakthroughs made with the standalone Oculus Quest. Most notably, the Rift S features Oculus Insight, a series on cameras on the headset itself that enable inside-out tracking for room-scale virtual reality and remove the need to set up external trackers around the user. In fact, the Rift S features an additional fifth Insight tracker to improve the quality of the tracking and ensure it remains compatible with all software already released for the Rift. There are more than 1,000 titles on the Rift store at present, and all will be compatible with Rift S. Equally, games released after the launch of Rift S will still be supported by the original Rift. Rift S also features a new ergonomic shape with a halo strap design, created in partnership with Lenovo. It will have a higher resolution display -- 1280 x 1440 per eye, the same as Oculus Go -- with a refresh rate of 80hz. It also features Passthrough+, which builds on the technology found in Oculus Quest that enables players to see their surroundings through the cameras built around the headsets. This can be used to draw 'Guardian' lines around their space with the Oculus Touch controllers, so players can ensure their play space is not blocked by any obstacles, such as furniture. Rift S will launch alongside Oculus Quest this spring, with the same price point -- $399 -- and bundled with the same redesigned Oculus Touch controllers. Speaking to GamesIndustry.biz, Oculus co-founder Nate Mitchell said the firm is now "in the process of phasing out Rift" and replacing it with Rift S.
The company will now focus its VR gaming efforts on both Rift S and Quest, with plans to keep the two ecosystems closely aligned. Almost all titles will feature cross-play between Quest and Rift S, which means when the former arrives users will automatically have a large player base to be matched against in multiplayer titles. Meanwhile, Oculus is also encouraging developers to enable cross-buy, whereby purchases made on one store will entitle players to the same title on the other. 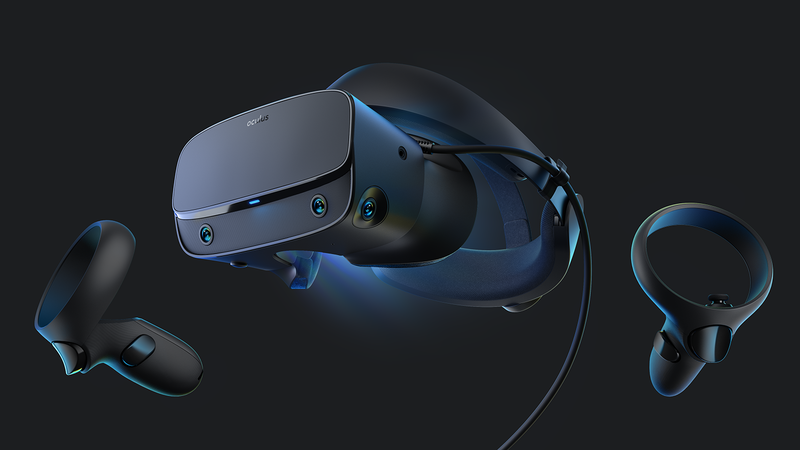 While Quest is Oculus' standalone headset, Rift S -- like its forebear -- will be connected to PCs via a five-metre cable. Answering questions from media at a preview event in San Francisco, Mitchell said the firm considered a wireless version but "found it didn't really make sense, especially from a cost perspective." He continued, "It's the same challenges we've talked about for years: a lot of costs, weight challenges, ergonomic concerns. Wireless also has some challenges in terms of compression and latency. We do think wireless is something super interesting going forward, but it's not something we're featuring as part of Rift S."
Vice president of AR/VR partnerships and content Jason Rubin added, "There's a balance that each one of these devices go through as you're making trade-offs. There's a perfect product we could ship that would cost thousands of dollars that no one would buy. Everybody has the thing they most want, that they say, 'If only you added this thing' -- we could trade off screen resolution against how much bit rate your transferring wirelessly against batteries against ergonomics. These are very complicated devices and we think we're in the right place on both devices, but there are trade-offs." When asked why the device has been dubbed Rift S rather than Rift 2, Mitchell described the headset as "more of an evolution of Rift than a revolution." "Rift S addresses a lot of the customer feedback we've heard time and time again," he said. We really want to get VR into the hands of everyone. Like Jason said, there are people that are going to want a $1,000 or $1,500 device but that isn't going to be something that helps our community or grows our ecosystem broadly. "When you think about what developers need most, it is actually just more users in the ecosystem, a larger total addressable market... We really think $399 is a sweet spot for both these products, and we think a lot of people are going to be excited about that price, so getting a lot more users into the Rift ecosystem, into the Quest ecosystem, and looking at that as one shared holistic space is really the goal."